Just like any proud tattoo owner, I love to talk about my ink. I also love to show it off -- and the beach is the perfect place to do just that. Four out of five of my tats are work-appropriate. When I got my fifth (in a particularly suggestive spot, close to my hip), I was hit by the overwhelming urge to be naked as much as possible just to show off the new ink. Over Memorial Day Weekend, I tied on my smallest bikini and hit up Central Park to get a tan and give my new tat time to shine. What I totally forgot to do was apply any sunscreen. The thing is, I'm normally an SPF fiend. I lather the stuff on like it's moisturizer and re-apply often. However, like an idiot, I totally forgot about my tattoos. My roommate (also an ink junkie) was furious. Bare skin needs SPF, and tatted skin doubly so. SPF 5 body oil won't cut it, either — you need to lather every inch of your skin with an SPF no lower than 30. Don't worry about tat-specific sunscreen, either. My absolute fave has been Coola Guava Mango Sunscreen Spray, and it's SPF 50. If you're more into lotions, I'm all about Moroccan Oil Sun Lotion -- it smells just like their ubiquitous hair oil. Be sure to look for broad-spectrum protection against both UVA and UVB rays. Even more importantly, you need to reapply often. According to the American Academy of Dermatology, that's once every two hours. You know you can sweat off sunscreen, right? Plus, reapplication is even more important if you're planning on taking a dip at the pool and literally washing your SPF away. Sunscreen is especially crucial for color tattoos. According to the FDA, the first color to fade from sun exposure is yellow. Darker colors will stay dark for longer but will also, eventually, break down to a dull gray. Hot, right? 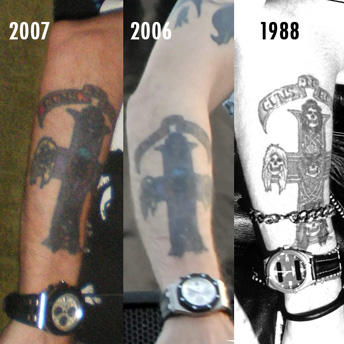 That also explains why your favorite aging rock stars (looking at you, Axl Rose) all have tats that resemble sun-faded cave drawings. If you opted for a watercolor or a white ink tattoo, you're even more likely to experience fading. Sure, they look cool when you first get them, but those tats never age well. White becomes an ugly brown, and watercolor tats have a tendency to fade quickly because of the lack of black pigment in them. That's only made worse with sun exposure. You can obviously try to cheat the fading process by re-touching your tattoos, but many studios have strict policies regarding touch-ups. My studio will only work on ink they have created, refusing to touch the art of others. The touch-up process is also expensive, and the removal process even more so. Plus, re-touched tattoos never look as good as the original. Your best bet is just sticking to sunscreen. If you think you can avoid all the havoc the sun can wreck on your tat by simply avoiding the sun and heading to a tanning bed, you're wrong. The concentrated UV light found in beds is even more harmful than regular sun exposure. If you plan on hitting the beach this summer, do the safest possible thing for your tat and keep it covered. Or, just hang in the shade instead. Your tattoos -- pretty and crystal-clear now -- will certainly not stay that way if you overdo the Vitamin D.